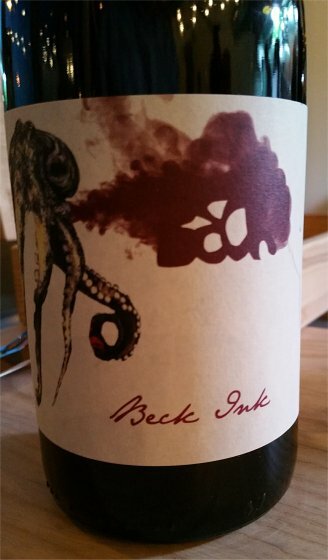 Squid Ink is a Manchester restaurant that opened only a few months ago, and they suggested Beck Ink to match the current menu, even though the wine did not feature on the printed list. The uncanny relevance of the wine’s label image to our venue was not lost on the restaurant, but I fear it is a little too expensive to ever be their house wine. Its retail price from Buon Vino is £12.50, while the restaurant served it for £25.00, which in my naïve view is a very modest restaurant mark-up. A lot more modest than the Romanian Pinot Noir on the list, which I was also considering. Turning the bottle to see the back label, we could see that the wine was 2014, certified organic, from Burgenland in Austria, 12.5% ABV, and bottled by Judith Beck. The Buon Vino website adds: biodynamic, wild yeasts, 80% Zweigelt 20% St Laurent, and that Judith Beck is also the producer. Oh, and it did go well with the food, so top marks to the restaurant for the recco. The menu was in the style that reads more like lists of ingredients than prepared dishes, but the three courses that the wine needed to match were basically: subtly spiced lamb meatballs on a bed of kale; chickpeas in pepper, tomato and harissa sauce with poached egg; and confit duck leg with pear and salad. Overall the dining experience was very good. There is just one four course menu, and a short wine list with not a Cab Sauv, Chardonnay or Pinot Grigio in sight. The kitchen is in the restaurant area, with food prepared single-handedly by the owner. Each dish was carefully designed and executed, with a lot more thought and subtlety than my descriptions above give credit for. The wine glasses were very good. They use Riedel glasses, and the Beck Ink was served in what I would guess was the Restaurant range Pinot Noir. It does make a big improvement to the experience of drinking wine compared to what you get with the dire quality of glass you get in the vast majority of British restaurants, even ones with fine-dining pretentions. I have only one general criticism: there were no starchy carbs in the entire menu. So don’t arrive too hungry. But it is not just a question of filling the belly. To my mind carbs are necessary to provide balance. Pitta bread with the chickpeas would have added contrasting texture if nothing else. And a few chips with the duck would not have gone amiss. If you are trying to be virtuous you don’t have to eat them. Nevertheless, a very good standard overall, and good value at £25 for the 4 courses. This entry was posted in My tasting notes and tagged austria, restaurant. Bookmark the permalink. Yes, Rob has a lot of interesting stuff. When I have created a bit more space, I must put in an online order. Squid Ink could be a good offline venue.